Unlike many other cats, jaguars do not avoid water; in fact, they are quite good swimmers. Rivers provide prey in the form of fish, turtles, or caimans—small, alligator like animals. Jaguars also eat larger animals such as deer, peccaries, capybaras, and tapirs. 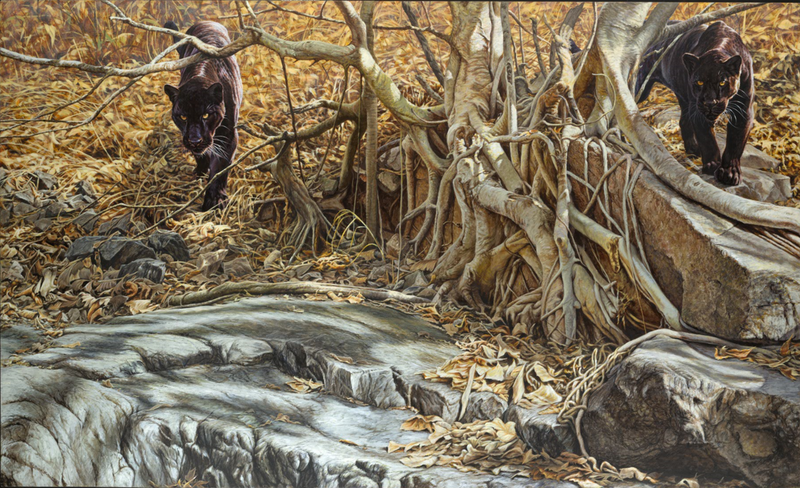 They sometimes climb trees to prepare an ambush, killing their prey with one powerful bite. Most jaguars are tan or orange with distinctive black spots, dubbed "rosettes" because they are shaped like roses. Some jaguars are so dark they appear to be spotless, though their markings can be seen on closer inspection, the Panther - Black Panther. 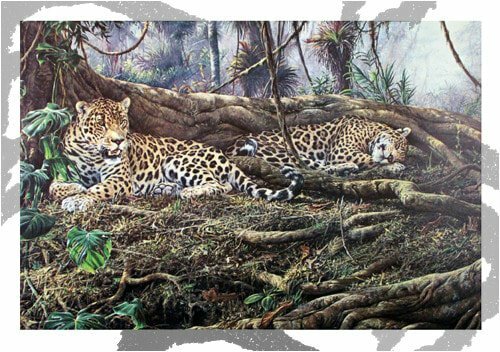 Jaguars can be found in their natural habitats of South and Central America, although jaguars have been spotted as far north as Southern California and Western Texas. Jaguars can vary in weight from around 120 pounds to over 210 pounds. 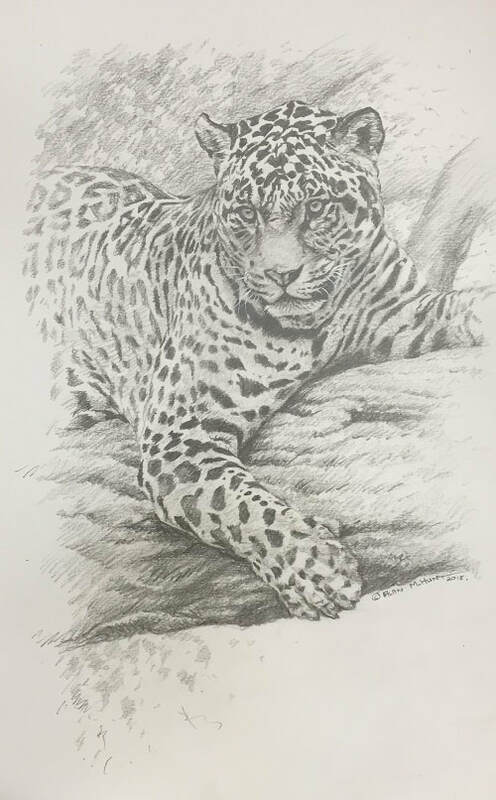 Some male jaguars have been found that weigh as many as 333 pounds The jaguar is the national animal of Guyana.Jaguars ambush their prey, rather than chasing it like lions and cheetahs are known to do. 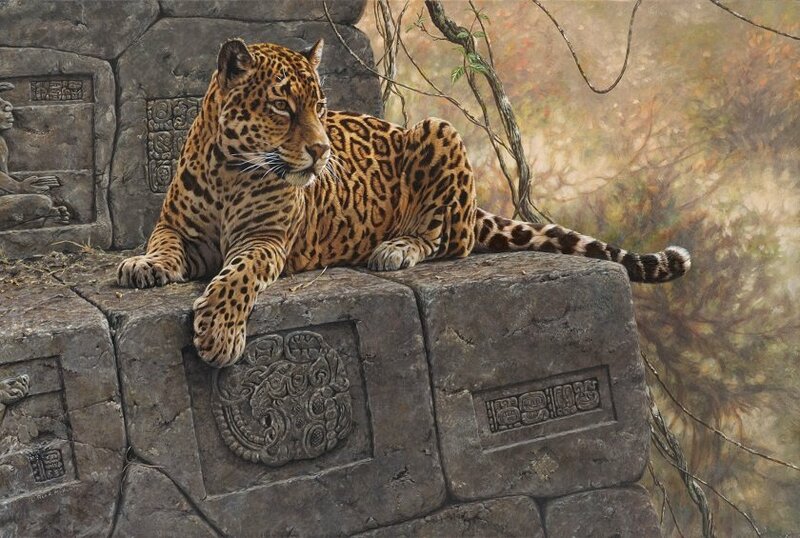 The Jaguar has been a symbol of strength and power in several South and Central American cultures, particularly in Northern Peru where the Moche culture painted images of jaguars on many of their ceramic tools and artifacts. 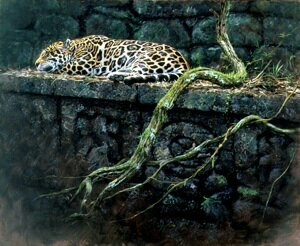 Jaguars also appear prominently in Mayan and Aztec culture. Jaguars have an eye-shine that helps them hunt at night. This eye-shine is caused by a mirror-like organ, and it reflects light onto the retina. Like other felines, this is why jaguars' eyes will seem to glow when light hits them at night. Jaguars are very much at home in the water. Seldom will they be found very far from a river or lake. A jaguar can fish by waving its tail over the water to attract hungry fish. Jaguars are still hunted for their attractive fur. 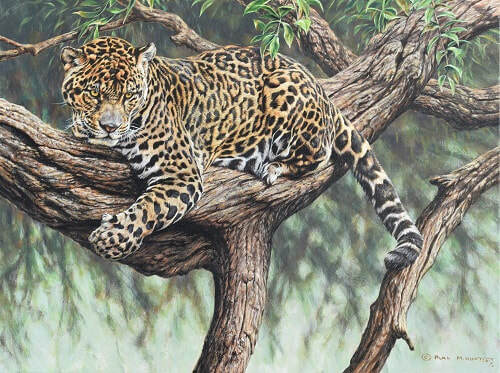 Ranchers also kill them because the cats sometimes prey upon their livestock.Jaguar is perhaps one of the most beautiful and amazing animals in the feline family. Jaguars are big, sleek and fast. Sadly, jaguars are a "near-threatened" species, which means simply that their numbers are reducing. As a near-threatened species, jaguars may one day be considered threatened or even endangered. Jaguars are generally between 5 and 6 feet in length, and stand around 25-30 inches tall at the shoulder. Female jaguars tend to be slightly smaller than males. A jaguar's jaw is very powerful, and may even have the strongest bit of any feline, including the lion. A jaguar's bite is so strong that it can even pierce through a turtle shell! Jaguars generally have a yellowish coat, but jaguars with colors varying from black to a reddish brown are not uncommon. The jaguar has spots, which will vary greatly in their size, shape, and patterns from one jaguar to the next.